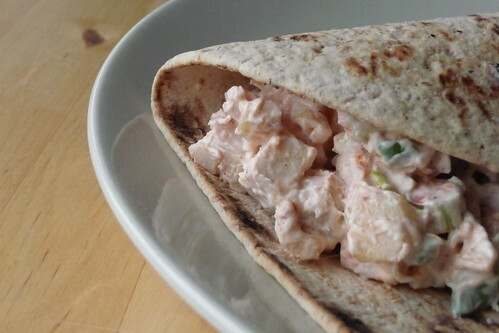 One of the best uses for leftover chicken or turkey is the humble chicken salad. Now, I wasn’t always a fan; in fact, since my experience for much of my youth was the chicken salad glop served in cafeterias or bad cafes, I really didn’t care for it. But, one year, I had an abundance of turkey after Thanksgiving. I had turkey coming out my ears! (Or so it felt.) I’d already made everything I could think of for leftovers and was scrounging around for another way to use up the leftovers. I found a recipe that sounded good, made it and promptly had it every day for lunch until my leftovers were good. Unfortunately, I didn’t write it down. Fast-forward to last week. We had some leftover rotisserie chicken which we had bought to make some fast dinners and lunches. Our favorite local grocery uses our preferred brand of chickens for their rotisserie offerings and since the whole raw chickens were more expensive and we wanted dinner somewhat soonish, we picked one up. After using about a quarter of the chicken, I had plenty of leftovers to use up. I started thinking about that recipe again and went through a bunch of the cookbooks I would have had at the time I made it the first time. I didn’t find much that I remembered but I did find one that sounded just as good. After I made it, I took a bite of my sandwich and closed my eyes in happiness. It might not be the same recipe but I think it’s actually better. Crunchy, not too sweet and packed with flavor.. all I have to do now is arrange for more leftovers so I can have this again! Combine everything in a medium bowl. Mix well to combine. Serve on toasted bread, buns or wraps. A bit of rocket/arugula, spinach, mesclun or other spicy salad mix is a good addition. This is roughly equivalent to 1 breast of a 3 lb roasted chicken. White or dark meat is good here. You can also reduce the amount of chicken without drastically affecting taste, just add more apple. Or regular paprika. I like the flavor of smoked best. Try a spice blend like a tandoori mix which uses cumin, ginger, coriander, salt and paprika. If you do, don’t add the smoked paprika and use 1/2 tsp of the mix. This entry was posted in american, chicken, dairy-free, gluten-free, one-dish, recipes, salad, untranslated. Bookmark the permalink. Cory, I think the apples really make chicken salad great. I really love Pink Lady apples because they are the perfect tart sweet. I have to tell you about the fish I made. Maybe you’ll want to try it. I bought some Steel-head at Costco and wanted a different approach. I had some Indian curry from World Market. I blended the curry with brown sugar and pressed it into the fish and baked it. It was fab. I used the leftover cold fish on spinach salad with Pink Lady chunks, graded carrot and pumpkin seeds. The first time I made a red wine vinaigrette with a roasted red pepper and a second time with raspberry vinaigrette. Both dressing choices were really good. The curry taste with the apples was so yummy. Yum! That sounds absolutely delicious and I’m definitely going to have to try that the next time we get some salmon in. (How I miss living in Washington, land of the readily available salmon!) My husband and I were just talking this evening about making some different vinaigrettes and both of the ones you mentioned are on our list to try over the next few salads. I bought some really flavorful bottled roasted red peppers at Costco, which I used in the dressing with some red wine vinegar I made and some hearty olive oil and a little mayo to make it creamy. I’m looking forward to trying your pizza crust this weekend! I really pushing my son into learning how to cook and he loves pizza, so your crust will be fun for him. Thanks for the great blog, Cori. I love it! Please let me know how it comes out! I bet he’ll like it too. Thanks for stopping by! I took a look at your blog and have to say that you have a lot of interesting stories and content. But, if I could give you a word of (admittedly unlooked-for) advice, it would be simply: use paragraphs. One long, unbroken block of text can be very challenging to read on screen! I doubt very much that you would tell a story in one long gasp of air without pausing to take a breath. Try writing as if you were telling your reader a story — just remember to breathe.